Ambassador, Fode Seck, the head of Senegalo-Gambian Permanent Secretariat has hailed the successful completion of the Trans-Gambia Bridge Project as a turning point for not only the people of neighboring Senegal and the Gambia but the whole sub-region and beyond. Ambassador Seck, the Executive Secretary of the Senegalo-Gambian Permanent Secretariat made the remarks during an exclusive interview with this journalist conducted in his office in Banjul ahead of the formal inauguration of the Trans-Gambia Bridge newly constructed at Yelli Tenda – Bamba Tenda crossing point in the Gambia next month. Presidents Macky Sall of Senegal and his Gambian counterpart, Adama Barrow are expected to be among the high profile figures that will grace the occasion. “The bridge is important for the people within West Africa as it will greatly enhance the socioeconomic development process. 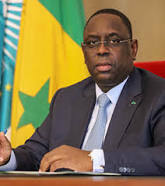 With the bridge, the people from Guinea Bissau, Guinea Conakry are happier than those from Senegal and the Gambia,” Ambassador Seck remarked. He emphasizes the fact that it will now easily linkup the south bank to north bank of the Gambia River as well as link up parts of Senegal and Guinea Bissau by road. This, Ambassador Seck continues, means a lot for the movement of people, transportation of goods and services as well as economic development and progress of the sub-region. “The successful completion of the bridge speaks volumes of the current excellent bilateral relations between Gambia and Senegal under the watch of Presidents Sall and Barrow,” he said. The Senegalese-born envoy stresses the point that the Trans-Gambia Bridge Project will greatly augur well for the integration process of The Gambia and Senegal which are often described as two states with one people. “If two family heads embrace each other it will only bring conducive environment for their people; leading to development,” Seck said while drawing parallelism regarding cordial relations of Gambia and Senegal under Presidents Sall and Barrow. He said few weeks ago, he took staff members of his secretariat on inspection mission at the bridge situated about two hundred kilometers (200km) away from Banjul capital in rural Gambia and he was struck by the experience while taking a stroll on the new bridge crossing from one bank of the river to the other. “Everybody is saying at last, the bridge is a reality,” Ambassador Seck reiterated. He observed that the Gambia and Senegal should have been a model for other neighboring states in Africa regarding achieving true integration of the people of the continent. “We should have been a model long time ago. But what happened had happened,” the envoy added. However, Seck quickly discloses that currently The Gambia and Senegal continue to enjoy excellent relations resulting into many tangible benefits for their people. He says his secretariat is coordinating the ECOWAS program of Observatory of Abnormal Practices which revolves around ensuring and enhancing free movement of goods, services and people among the two neighboring states while checking against the flow of illicit drug, illegal logging and the like within the region. 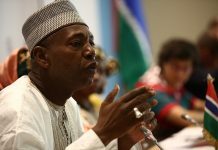 According to the envoy, Gambia and Senegal have set up a number of commissions like: The Joint Border Management Commission and the Joint Defense and Security Commission which have been working hard to ensure that life becomes easier for those crossing the borders as well as containing the bad guys within the two countries. Senegalo-Gambian Permanent Secretariat is an interstate institution for functional cooperation, harmonization of policies and multilevel integration between Gambia and Senegal. Meanwhile, The Trans-Gambia Bridge Project is part of The Trans-Gambia Road Transport Corridor which is an economic and strategic link connecting the northern and southern parts of both The Gambia and Senegal, and by extension ECOWAS countries through the corridor between Dakar and Lagos. The project, financed by the African Development Bank (AfDB), supports regional integration and is consistent with the bank’s key focus areas of infrastructure and regional integration as mentioned in the bank’s Medium Term Strategy. The 1.8 kilometer bridge is over 5 stories high. It is designed to accommodate passage of most vessels, while longer-mast boats can easily fold their masts to pass through the bridge. The engineers described it as one of the biggest in the sub region.